let’s talk about crap mexican food here for one second. isn’t it supposed to be flavorful? filling? spicy and rich? to me, mexican food is an experience. it’s about patios and margaritas and laughing and chips and salsa and tacos and cilantro and onion and beans and rice and tequila and time passing by and friends. oh, and cheap. not here, no thanks. to any of the above. not only did matthew get sick (though i won’t fully blame the food) – it’s less than mediocre. no flavor, nothing. albeit, i’m a mexican food snob…and the only way to get good enchiladas in the midwest is to make them. 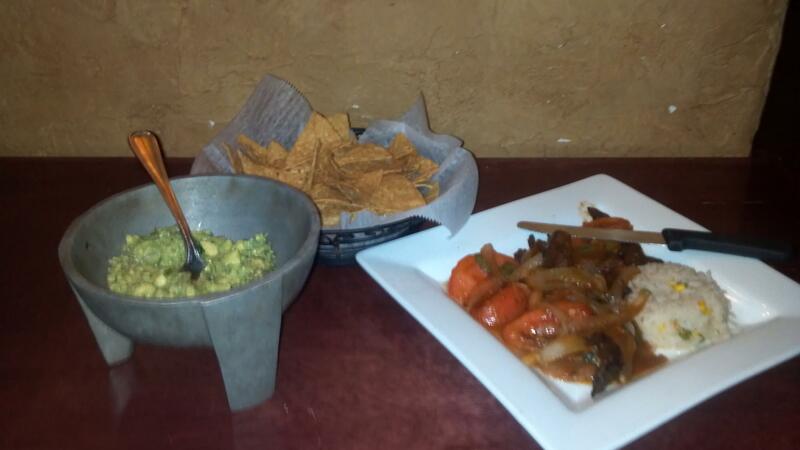 the guac is okay because it’s fresh – but honestly i prefer the tamale spaceship’s guacamole, or my own. but everything else from the margaritas to the dishes were just terrible. i usually eat all my food (starving kids everywhere!) and quickly. and i think it took me awhile to attempt to finish this, and i still didn’t. ambiance is a typical mexican spot where people try to make it more than it is. dim, artsy, forgettable. the patio is nice though. service is also forgettable. nice but lacks awareness – i.e., when asked his favorite dishes…he didn’t know. …what. overall, i don’t think anything could bring me back here. unfortunate, since the location is so great. don’t be fooled.